How will you cut firewood when you’re camping? What tool will you use to clear a fallen log or build a lean-to? And which type of blade is best for slicing through bone? While you could use a hatchet for some of these tasks, a saw is easier to use. But then the next question is which kind of saw? Would a bow saw, a pocket chainsaw, or a folding saw be more convenient for outdoor survival? The answer is that each one has its place in your arsenal. What will you cut the most? And how will you maintain the saw if it dulls or breaks? Let’s examine the pros and cons of each type of saw. The pocket chainsaw is the most portable of all three types. It’s lightweight and compact and handy as a backup. But it’s not likely to last for a lot of cutting. The chain will dull or break and isn’t replaceable like the blade of a bow saw. You’ll need to plan on sharpening and oiling it. A folding saw is the next most portable and compact tool besides a pocket chainsaw. This is the tool you’ll grab to trim tree limbs. It’s also excellent as a backup for a large bow saw. But it is too small for downing trees bigger than a sapling. You might not be able to sharpen this type of saw, but you may be able to replace the blade on some brands. Bow saws generally use one of two varieties of replaceable blades. One is for cutting dry wood or lumber, and the other is for green wood. This makes it versatile and able to remain useful even if a blade breaks. Although you can disassemble a bow saw for transport, it’s bulkier than a pocket chainsaw or a folding saw. But some models fold up, too. The features we looked for in these bow saws include durability, ergonomic design, and ease of blade replacement. Of course, weight and size are a factor if you plan to backpack with one. Bahco’s 30-inch bow saw for green wood is one of the best for camping and survival. It has a replaceable blade and adjustable tension as well as a knuckle protector. And its size makes quick work of logs and lumber alike. Bahco also sells the 30-inch bow saw with a blade for dry and seasoned wood. It’s similar to the one described above that cuts green wood. Plus, both of these saws are available in 21 and 24-inch versions. The advantage of the 21-inch Bahco saw is that it has a pointed nose that fits into small spaces. Like the other Bahco bow saws above, this one has a tubular steel handle with a knuckle protector. Also, you can adjust the tension and replace the blade. The Freescape camp saw features a foot-long replaceable blade that folds down into the handle. It also has a rubbery non-slip grip. This tool is a good compromise between a bow saw and a folding saw. The Truper 30255 bow saw is just as large as the Bahco saw but it has a slightly different design. The quick change system simplifies swapping blades. But the packaged blade is best for lumber. You might want to purchase replacements for cutting green wood when you go camping. Also, the 24-inch and 21-inch versions have progressively narrower tips to fit into tight spots. The 21-inch bow saw from Coghlan weighs one pound and folds down for transport. The aluminum handle has space to hold replacement blades. And some campers prefer Coghlan’s model to the well-known Sven Saw with a similar triangular format. They say Coghlan’s is more durable and quicker to deploy. The Sven Saw is an American-made barebones backpacking saw that sports a tempered Swedish steel blade. You can release the blade and fold it inside the aluminum handle. And although this is the 21-inch size, the same saw is available with a 15-inch blade. Folding saws are convenient for clearing brush, taking care of game, and a little light construction. They can perform cuts that chainsaws and bow saws can’t manage. For example, if you need to join wood, you’ll have much more control cutting a joint with a folding saw. Bahco’s Laplander folding saw is a favorite backup tool for many survivalists. It has a 7.5-inch rust-resistant blade that stores inside the ergonomic handle. Additionally, the stock blade has seven teeth per inch for slicing anything from green wood to bone to plastic. The main benefit of the Gerber folding saw is that you can exchange the two 7.1-inch blades that come in its package. These include one fine tooth blade for bone and one coarse blade for wood. Moreover, the saw only weighs 8.4 ounces. The Felco F-600 stands out because of its no-bind blade. The 6-inch blade is shaped to be thin at the top and thick by the teeth so that it won’t get stuck while you work. As such it’s capable of sawing 4-inch diameter branches. Also importantly, it only weighs 5.5 ounces. 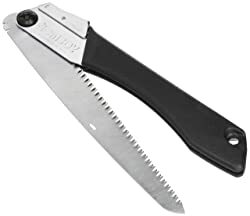 EverSaw’s all-purpose folding saw has an 8-inch blade with triple-cut razor teeth that slice through plastic, wood, or bone. Its shape allows for pull-cut sawing. Moreover, it comes with a 100% satisfaction guarantee and a lifetime warranty. Corona’s RazorTOOTH pruning saw has a 10-inch blade with six teeth per inch. These three-sided teeth are impulse-hardened, and the blade is chrome-plated for smooth sawing. 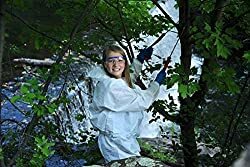 Overall, the blade can handle branches up to 6-inches in diameter. In addition, you can replace the blade. The Japanese-made Silky Gomboy features 8.5 teeth per inch on its 9.5-inch-long blade. This fact lets it saw both seasoned lumber and green wood with impunity. Also, the blade is made of high-purity Japanese steel. Subsequently, it weighs 12.7 ounces with its transparent plastic carrying case. While we wouldn’t depend on a pocket chainsaw as our only tool for cutting wood, they are speedy and convenient for ripping wood in a way that other types of saws are not. The 36-inch bi-directional chainsaw from Sportsman Industries is one of the most popular models. It has nylon strap handles plus a carrying case with belt loop. The whole package weighs less than five ounces. And it comes with a 100% satisfaction guarantee. As you draw the chain back and forth, the self-cleaning teeth chew through the wood. Each tooth is made of high carbon heat-treated steel for the longest life possible. Moreover, you can sharpen them with a 5/32” chainsaw file. Finally, the length of this chain makes this model desirable because it’s potentially faster than shorter saws. The 24-inch American-made Chainmate saw is comprised of carbon steel teeth with diamond tips. It comes with a pouch and belt clip for storage. Also, its straps are large enough to use when you’re wearing gloves. If the two-foot chainsaw isn’t the right size for you, the same company makes three and four-foot-long versions. The LivWild chainsaw features heat-treated steel teeth on every chain link. The teeth self-clean as you cut through wood. Furthermore, you can sharpen them with a 3/16” round chainsaw file. LivWild also offers a carrying pouch with a Mylar emergency blanket. We think that all three types of saws in our review are important for your survival kit. But if you must narrow down your choices, let’s see if we can help. First, think about the most likely situation where you will need a hand saw. Will you need to cut firewood? If this is a repeated task, your best bet is probably a bow saw. With a bow saw you can replace the blade when needed. And replacement blades aren’t very heavy nor do they take up much space. On the other hand, a pocket chainsaw is useful, too, but you’ll need to sharpen it. This means bringing along a file and taking the time to do the work. But if the chain breaks, you’ll want to have a backup saw on hand. While a folding saw may be too small to fell a tree, it’s perfect for lopping off branches. It’s also handy for horn and bone and even plastic. Many folding saws have replaceable blades, so they don’t stay out of service for long. And they are more portable and lightweight than a bow saw. Some folding bow saws like the Coghlan’s endeavor to combine the best of both worlds. Next, consider any limits you might have for weight and portability. This includes replacement blades if applicable. The final factor is the price. The initial price of a saw is only the first step. If you need to replace blades, that increases the cost. For this reason, it’s wise to buy well-known brands that are backed by a satisfaction guarantee and a warranty. Check to see if you can buy replacements easily. We hope we helped you narrow down which backpacking saw is your best bet for camping and survival. If you’re still not certain, it’s smart to get one of each kind and test them yourself. In this manner, you’ll learn which style most suits your needs. More importantly, you’ll familiarize yourself with these essential tools so that you’ll be ready to use them in the future. Thanks for the amazing post. I do like the folding saws; when packed they will take less space of your backpack.